I just got this adorable set of bibs from Baby Sonny. I love these bibs. They are so cute! They come in a set of four bibs each one a different design. This set has four different designs, a yellow/white chevron, blue polka dots on white, pink with white stars, and grey with white polka dots. They are really well made. The closure is a snap closure with two different sizes so you can easily choose the size that works best for your little one. They are a really soft cloth on the inside of it, it stops leaks and I use it a lot to wipe their face also when they are done eating. The stitching is really well done and reinforced. These make adorable shower gifts as well. I got my set to give as a gift and I can’t wait for the person I got them for to open them and see their reaction. Super super cute and high quality. 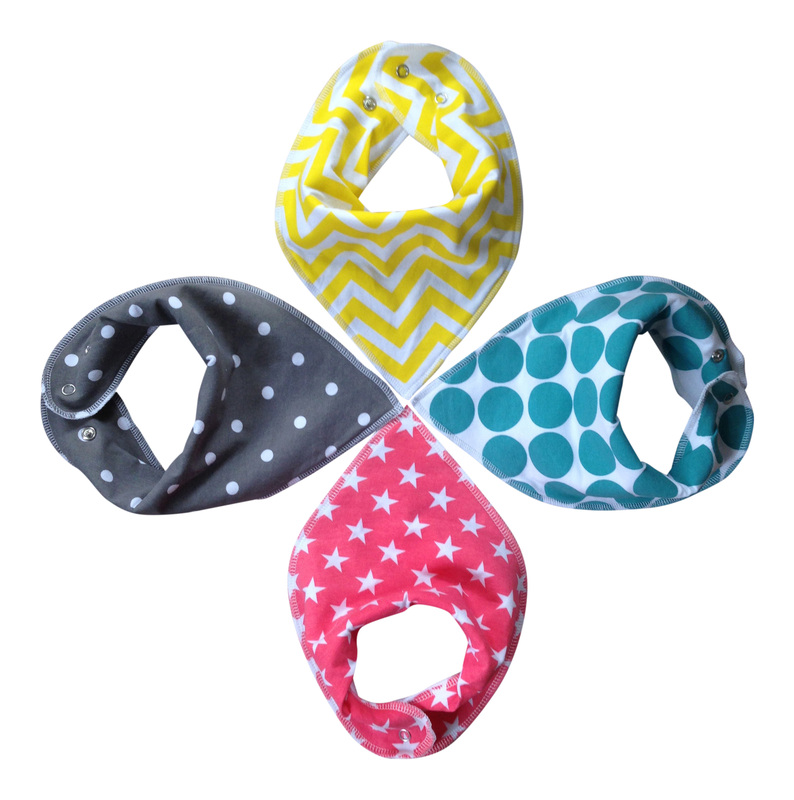 SUPERIOR BABY BANDANA DROOL BIBS – Front is made of 100% soft organic cotton backed by an absorbent polyester fleece to protect your little ones baby soft skin from rash and irritation whilst soft and comfortable for bambino. Keep baby’s clothes dry from dribble without the use of an uncomfortable plastic or waterproof layer and no more need for 3-4 changes a day. Easy to store in diaper bags or stroller compartments and also great to have on hand when burping or feeding. ADJUSTABLE SNAPS – Nickle-Free Adjustable Snaps For Growing Babies between 3 and 24 Months. Sure to stay attached, leaving baby to play to his/her hearts content. Great alternative to velcro straps which easily come off and can also snag and ruin clothes in the wash. Washing machine safe. Keeps shape after wash so no more curling ends that don’t sit flat. SUPER STYLISH – Cute and fashionable designs will make your baby stand out for all the right reasons. No longer will your bubba’s gorgeous outfit be covered by a ‘practical’ ugly bib, but enhanced by the trendy Baby Sonny bib. UNIQUE BABY GIFT SET – Our baby bandana bib set is one of the most unique and fun gifts mother and baby can receive. The perfect choice for baby showers, birthdays, christmas or just because! BACKED BY THE BABY SONNY PRODUCTS GUARANTEE – We guarantee you will love our drool bibs, and if for whatever reason you aren’t 100% satisfied, return it within 90 days for a full refund, no questions asked.